I love just about anything made out of chocolate. I’m always eyeing the candy aisles at Target or Wal-mart to see if I want to try some new chocolate product, or if I want to bring home an old favorite. So of course I jumped at the chance to review choccreate.com, a website where the customer can design his or own chocolate bar, right down to the ingredients and the type of chocolate. I was overwhelmed with the possibilities when I got started with my complimentary $25.00 gift card. I was able to choose between the following types of chocolate: dark, milk, or white. I’ve never been a fan of dark chocolate, so I created only chocolate bars made from milk and white. 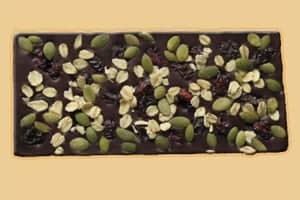 Some of the custom ingredients I could add to the mix were really surprising to me–I never would have considered adding something like chili powder or crushed red pepper to chocolate. When designing my custom bars, I took the totally safe route. With $5.95 reserved to cover the shipping costs, I had $19.05 left to cover the cost of any bars that I designed. In total, I created 4 chocolate bars. 3 of them were made from milk chocolate, and 1 was made from white chocolate. 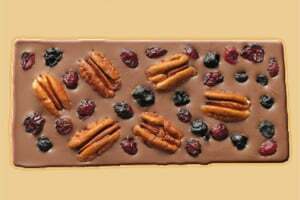 The milk chocolate bars that I created contained M&Ms, almonds, and shredded coconut. I got a little adventurous with the white chocolate bar, and added brown sugar to it. Each 3.5 oz. chocolate bar is $3.75 plain, and the price goes up when you start adding in the ingredients. The ingredients begin at $0.65 each, and can go up to about $3.50 each. You can even combine more than one ingredient in your chocolate bar. If I could do it all over again, I think I would get a bit more creative and try something totally new. I definitely played it safe, but I loved every bite of this chocolate. I was crazy for the white chocolate with the brown sugar, and while I liked the milk chocolate that choccreate.com uses, I wasn’t as in love with it as I had thought I’d be. The chocolate bars arrived in a beautiful brown and pink box, and would have been a lovely gift for someone if I hadn’t decided I wanted this chocolate all to myself. If you want to give this a try, check out Choccreate’s bestsellers for some unique chocolate bar flavors. Simply Stacie readers are eligible for 20% off their entire purchase with this code: “simplystacie”. This offer is only valid through 2/28/2011. I’d love to try the Dried Blossom Mix with chocolate. It seems like a weird mix but the site says it’s chewy like craisins, so it might work! Love the Salsabol from your Open Sky Store. I entered the Pretty Neat Giveaway for $250 Cash. I voted today for Simply Stacie on Picket Fence Blogs. My fave item at Open Sky Store is Hello Kitty Cool Mist Humidifier. I think White Chocolate and Blackberries would be unique but work well together. Nicobella Vegan Organic Dark Chocolate Truffles-Variety Box.